I make a living from selling my creativity, yet I put my money where my mouth is and always adopt the most liberal policy. My e-books are DRM-free and loanable whenever it is possible. I'm not a fan of restrictions. I trust people to be honest. Those that aren't will do what they want anyway, so there's no point worrying about them. Two things got me thinking about it again this week. If you dislike DRM in computer games, are you a criminal? I read a comment online (computer game forum) that the only people who dislike DRM are criminals who want to pirate games and not pay for them. I realise the commenter probably didn't intend it seriously, but it does become a refrain, which can be mildly hurtful when people like me have spent so much money on games over the last thirty years, often just to support the developers. GOG says I have 410 games. Steam says I have 359. I also owned games on itch.io, Gamersgate etc. I have no pirated games. I just avoid games with DRM due to all the problems with it - it's a system designed to limit things, and not to add anything beneficial. I've had problems with games, music, films (I once had to return a projector because of the Macrovision DRM in some films). Yet I have never had a lack of DRM be a problem. I bought Inside and Doom (2016) and many other games as soon as they removed Denuvo (I monitor this page), even though I didn't think I'd enjoy some of them. I'd do the same if Resident Evil 7, Dishonoured 2 or Prey removed it. Until then I'm quite happy with the many games I own but have never played, or would play again. I should add that I still play games from over 30 years ago. Many of today's DRM systems would prevent that being possible 30 years from now. Just think of how much trouble people still have getting relatively recent GFWL games to work (where publishers never bothered to strip it out). Does the DRM protect profits? It is certainly lost sales to people who avoid DRM. I can sort of understand some publishers panicking about release weeks, but even then they should remove the DRM after a few months. I don't think CDProjekt worried about the Witcher 3 being released with no DRM - and because they focus on the long tail, not just the nonsense of opening week, they still sell a lot of copies today (as GOG charts often show - in fact, I am not a Witcher fan, but bought all three games just to support them). The Wikipedia article shows that most Denuvo games have pirated copies available anyway, so it is just an additional expense that serves no end. So from a publisher point of view, adding DRM like Denuvo doesn't necessarily protect a game or increase sales. It can lose sales. From a customer point of view it adds nothing at best, but can cause problems at worst - at the very least by making you use the software and your PC in particular ways, such as being online (I only tried one Denuvo thing, and that was a headache). If people have never had issues with DRM (or that were traced back to DRM) then good for them. If you like DRM, fine. But just don't assume that everyone who is against it is dishonest or a thief. There is a lot more going on. One more example. I stopped buying music (even CDs) when there were lots of formats with DRM and it got confusing - I think one of Microsoft's DRM issues left people unable to play music. Anyway, the good news is that the industry saw sense and accepted MP3 as the (DRM-free) default. In the ten years since then I have bought more music than at any other point in my life. Restrictions make people wary of spending, or spending as much; openness encourages support. I'm far from wealthy but still spend quite a bit on buying DRM-free works from other creative people - musicians, developers, artists, authors and so on. One person said that it isn't worth worrying about, and publishers all remove Denuvo after a while because of ongoing costs. Sadly, that is not true. It may be easy for the devs to remove, but we can't rely on that. There are lots of games that have been cracked, yet nearly four years on still haven't had Denuvo removed (suggesting they maybe never will). I read about this on Rock Paper Shotgun. And it ties in to DRM and your ability to play purchased games. Steam is an online games store, and also a software client they force you to use in order to play the games you buy. The software client is a form of DRM, and a means of delivering the game to your PC. The main problem is that the games and the DRM/delivery mechanisms are different things. Because Steam ties the games to a DRM/delivery mechanism, shifts in what Steam supports will remove access to games that would have run fine on an old operating system (OS). So we get the weird situation that some of the old games may well run better on older operating systems, because those are the OSs that the games were written for, yet they will now not be installable on those OSs. I think that's a poor service to customers. I don't use Windows XP as my main OS (that is Windows 7 ** - I tried Windows 10 three times on different PCs, and really dislike it as a day-to-day tool), but that doesn't mean I wouldn't use XP in specialist scenarios. For example, I have lots of old hardware and existing OS licences. I hate waste, so always try and re-use things before I recycle them. 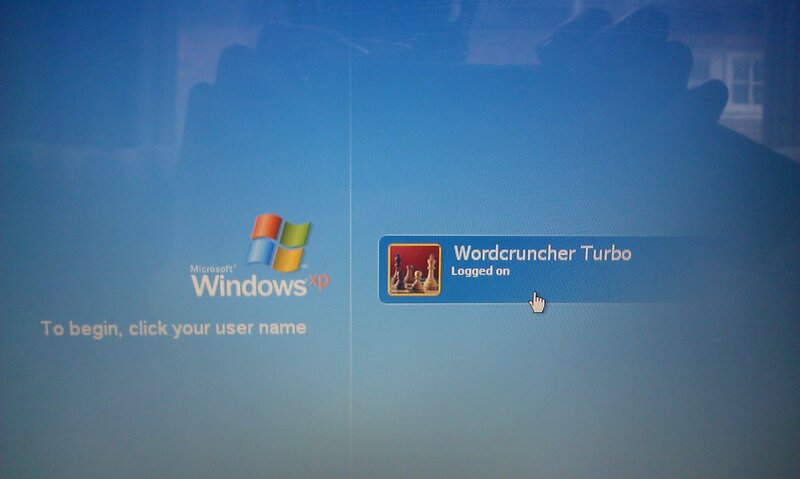 So I recently dug out an old laptop. It is too old to run any OS after XP, but it runs XP fine - in fact, because I'm not using it as a day-to-day laptop, and it only has one or two pieces of software installed, it's surprisingly zippy. 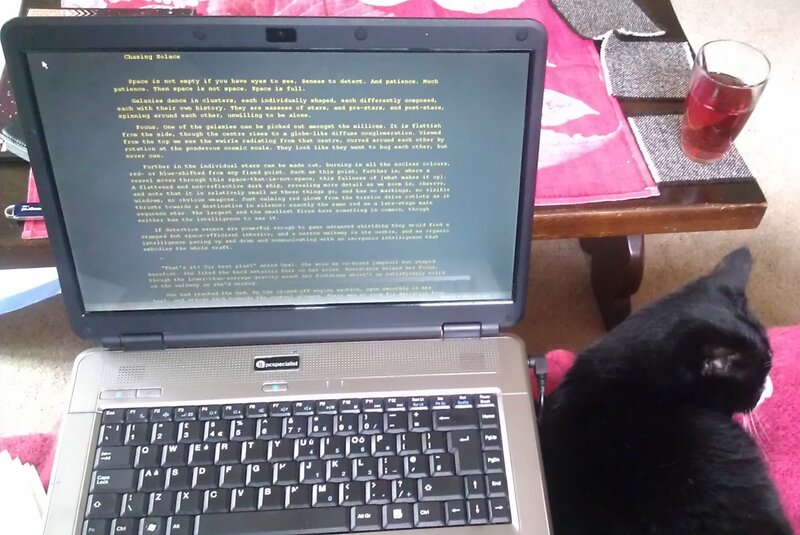 I wanted a laptop for writing first drafts of novels on. My main PC has too many distractions; also my main PC is a desktop and I already spend too many hours a day sat down. With the laptop (named "Wordcruncher Turbo") I can work in different places, or even standing up (which is my preference). I didn't install MSOffice on it, just a distraction-free plain text writing program with clicky typewriter sounds. I love it, and my productivity has gone up. Note that although the laptop has Wi-Fi I don't use it - I didn't install a browser or email clients, just installed stuff from USB. So there is no need for a more modern OS for this purpose, and it would just cost me money and waste the things I already had that were perfectly suited to the task. How does that tie in with games and Steam? 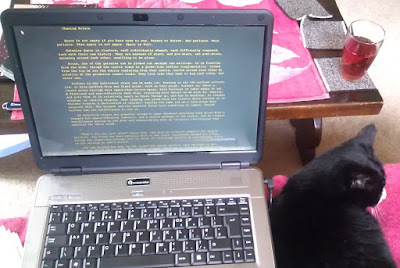 Recently I took Wordcruncher Turbo on a cat-sitting writing retreat to get a chunk of first draft written on my next novel. The place I was staying at had no Wi-Fi. After writing all day I wanted to unwind. I generally watched TV or read. Playing a game is also something I like to do, and my GOG and Steam libraries include hundreds of games that run fine on low-spec systems and older OSs, from HoMM2 to FTL. In theory I could install some with Steam, go into offline mode, and play them whenever I want. However, once Steam stops supporting XP that won't be possible. I'll own games that would run fine on my laptop, but Steam's DRM/delivery system will specifically prevent me from installing or playing them on it. Some years from now that probably will happen to later OSs too, until the point comes that I can't play Steam games on any of my Win7 systems (even though it may be the best OS for the games themselves). This is why GOG is so good for me, with its offline installers. Those offline installer files are all I ever use - I don't bother with their GOG Galaxy client because I want to get away from all that updating software separate from the games. I can download a game's installable files. I can keep them on my PC and (in theory) even if GOG disappeared, I still have all my games. I can install any I want on my laptop. Steam has the most games available for sale. It's also pretty heavily DRM-infested (I have to check carefully to make sure I don't buy games with Denuvo, GFWL, uPlay, Origin, or any of the other systems that are still parts of many Steam games). Steam isn't ever going to change their system - Steam don't even want to include a DRM-free filter, because it might upset publishers and draw attention to these issues. So, really, Steam is going to stay the same and always be a case of knowing that your access to the games is not indefinite and unrestricted. It's why I only buy Steam games when they are heavily discounted. Whereas I will often pay full price on GOG because I am getting a lot more for my money - games I can download and backup myself, that don't have all these DRM restrictions and tied delivery mechanisms. At present I have hundreds of games on GOG and hundreds on Steam, but I am already noticing a change in that I am clearing my GOG wishlists much quicker, because these issues are getting more important to me as time goes on. And, truth be told, even though lots of games I like the look of are currently Steam-only, I have no shortage of games. The opposite. Around 50 I haven't played; hundreds I have played a bit and mean to come back to; and loads that I have completed a number of times and regularly reinstall to play again (the VampireTMBs, HoMMs, the System Shocks, the Deus Exs and Thiefs, the Amnesias and Penumbras, the FTLs, the Mirror's Edges etc). I am never going to be stuck for games, even if I only used GOG. And over time, some of those Steam-only games will probably appear on GOG anyway, and probably be a lot cheaper a couple of years down the line. So rather than get stressed about the situation, I just intend to shift my purchasing to better future-proof my games collection. I still regularly play games that are over 30 years old, so I care about access to what I've paid for. 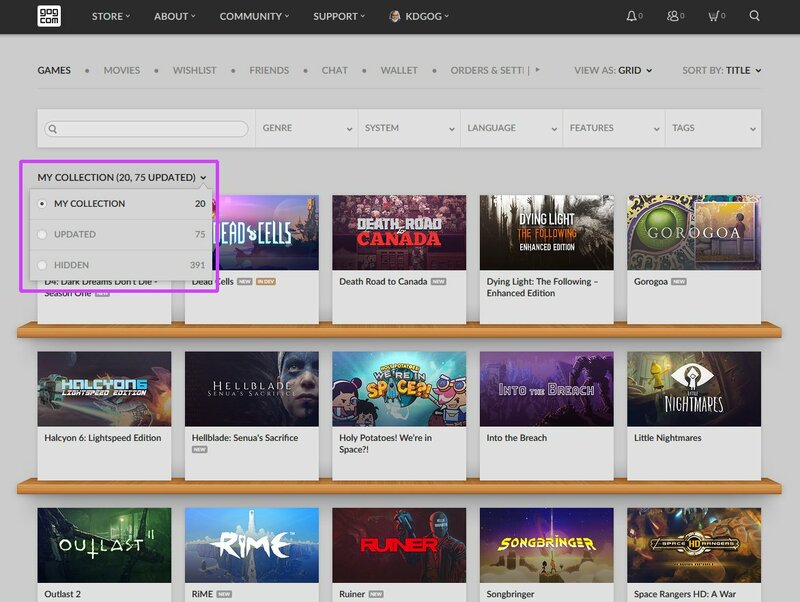 Update 21 August 2018: GOG has a useful new anti-DRM information site, FCK DRM. I'm all for keeping this issue at the forefront. It has plagued software for decades. In fact, many of the games I played on my C64 had DRM in to either stop you copying them/backing them up, or to stop you playing them if you didn't own the manual/code disk. The original games for many of the 8 bit computers on tape would likely be unplayable nowadays. It's only the fact that the DRM was cracked and removed that means the games are still playable.